If you're like most women, you own a handbag for every day of the week. (Or month.) But how about one for every state? 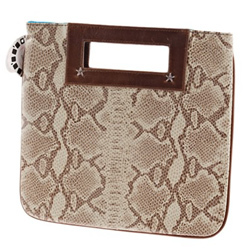 The Arizona Rattler ($30) is a gorgeous rattlesnake-printed lambskin foldover clutch. A cutaway handle makes for easy carrying, and turquoise lining adds a hidden bright spot to the bag. 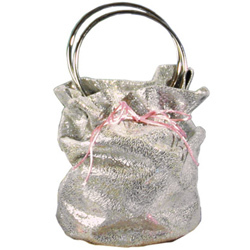 The Arkansas Diamond Digger ($64) is an eye-catching, mini drawstring bucket. Made of shiny silver lambskin, the bag closes tightly with pink satin straps, and topped with oversized silver bracelet handles that allow it to swing from your wrist. The Missouri "Creve Coeur" Clutch ($50) is the perfect party clutch. 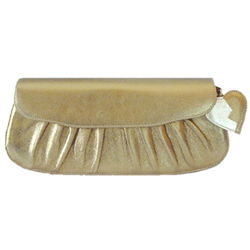 Made of metallic gold faux leather, the clutch has a ruched body covered by a rounded flap. A shoulder strap can be tucked inside if you want to carry it in your hand, and a broken heart keychain hanging from the side adds a feminine appeal. Also available in bronze, black, red and silver. Check out the rest of the collection at Star 50 bags.com.